Father Thomas Keating who is one of the architect of the Centering Prayer movement, was present in the Oneness & Heart of the World event at Boulder, Colorado - where i had the privilege to be present. Today was the full day long event with talks, discussion, prayer and meditation with both Llewellyn Vaughan-Lee and Father Keating. Although previously i have listened to Father Keating's talk via youtube when he was invited by Ken Wilber, but this was the first time to watch and listen him talk. He is such a brilliant personality, may God bless him and his work. What really touched me and i'm sure other audience present was his deepness of understanding and wisdom and at the same time the charming ability to express innocent humor. Often time the discussion went into deepest arena of theology, philosophy of non-duality, of GodHead, themes such as the ultimate reality and experience of oneness, yet time to time with his most sweet sense of humor Father Keating kept the audience into laughter of joy and tears. Its a really rare that in one hand while tackling the most difficult questions how Father Keating on the other hand kept everyone in amusement. The laughter and joy was dancing into the eyes of all mystics present there. Commonly it has become a norm that religious people are generally have extra-serious attitude and devoid of sense of humor. Figure like Father Keating who is a mystic in heart is a great example to break that taboo. In the real sense, humor is an integral part of spiritual life, it is what is necessary to be fully human and fully enlightened. The example of Laughing Buddha is a great reminder who answer every question with a laugh. As i was sitting and laughing with Father Keatings jokes and spiritual humor, i was thinking, if someone really wish to experience the most joyful laughter, probably i would recommend to go and listen to Father Keating when he gives talk to an audience face to face. Needless to say, i surely had a great day of laughter of pure joy. Sometime it really helps to be a mystic to get the inside sense of humor to laugh heartily with one's whole being. 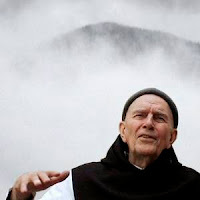 [>] Video of one of the talks of Father Thomas Keating is available via Global Oneness website.
. Do they go together?